The OmegaCAM imager on ESO's VLT Survey Telescope has captured this glittering view of the stellar nursery called Sharpless 29. Many astronomical phenomena can be seen in this giant image, including cosmic dust and gas clouds that reflect, absorb, and re-emit the light of hot young stars within the nebula. The OmegaCAM camera on ESO's VLT Survey Telescope has captured this glittering view of the stellar nursery called Sharpless 29. Many astronomical phenomena can be seen in this giant image, including cosmic dust and gas clouds that reflect, absorb, and re-emit the light of hot young stars within the nebula. The region of sky pictured is listed in the Sharpless catalogue of H II regions: interstellar clouds of ionised gas, rife with star formation. Also known as Sh 2-29, Sharpless 29 is located about 5500 light-years away in the constellation of Sagittarius (The Archer), next door to the larger Lagoon Nebula. It contains many astronomical wonders, including the highly active star formation site of NGC 6559, the nebula at the centre of the image. This central nebula is Sharpless 29's most striking feature. Though just a few light-years across, it showcases the havoc that stars can wreak when they form within an interstellar cloud. The hot young stars in this image are no more than two million years old and are blasting out streams of high-energy radiation. This energy heats up the surrounding dust and gas, while their stellar winds dramatically erode and sculpt their birthplace. In fact, the nebula contains a prominent cavity that was carved out by an energetic binary star system. This cavity is expanding, causing the interstellar material to pile up and create the reddish arc-shaped border. When interstellar dust and gas are bombarded with ultraviolet light from hot young stars, the energy causes them to shine brilliantly. The diffuse red glow permeating this image comes from the emission of hydrogen gas, while the shimmering blue light is caused by reflection and scattering off small dust particles. As well as emission and reflection, absorption takes place in this region. 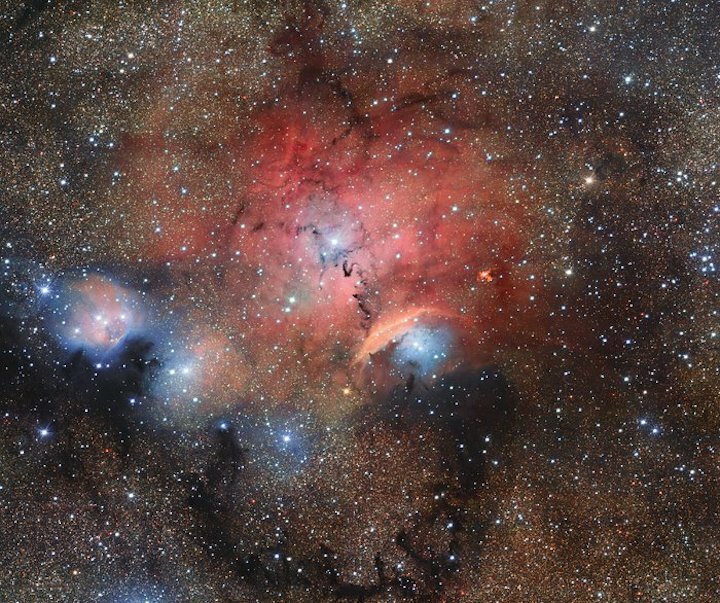 Patches of dust block out the light as it travels towards us, preventing us from seeing the stars behind it, and smaller tendrils of dust create the dark filamentary structures within the clouds. The rich and diverse environment of Sharpless 29 offers astronomers a smorgasbord of physical properties to study. The triggered formation of stars, the influence of the young stars upon dust and gas, and the disturbance of magnetic fields can all be observed and examined in this single area. But young, massive stars live fast and die young. They will eventually explosively end their lives in a supernova, leaving behind rich debris of gas and dust. In tens of millions of years, this will be swept away and only an open cluster of stars will remain. Sharpless 29 was observed with ESO's OmegaCAM on the VLT Survey Telescope (VST) at Cerro Paranal in Chile. OmegaCAM produces images that cover an area of sky more than 300 times greater than the largest field of view imager of the NASA/ESA Hubble Space Telescope, and can observe over a wide range of wavelengths from the ultraviolet to the infrared. Its hallmark feature is its ability to capture the very red spectral line H-alpha, created when the electron inside a hydrogen atom loses energy, a prominent occurrence in a nebula like Sharpless 29.